1. Our section for CONTEMPORARY DANCE ANNOUNCEMENTS has improved functions. 2. 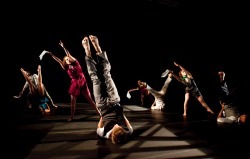 Reminder: since the 15th May 2011, contemporary-dance.org has its own Facebook page. 1. NEJLA YATKIN’S DANCING EXPERIENCE. - Now you can upload up to four pictures to complement your announcement. - The general display is different. The posts appear listed by title and you can click on them to read the whole post. I believe it works much better like this. Use it and let me know what you think! 2. Reminder for those who might have missed the news in the last issue:since the 15th May 2011, contemporary-dance.org has its own Facebook page . To stay in touch through Facebook or to support our website, don´t forget to visit that page and click on the 'like it' button. During the months of May and June 2011, the Turkish-German dancer and choreographer Nejla Yatkin visited Colombia to perform the role of Medea. This was on the occasion of a contemporary dance production directed by Colombian choreographer Peter Palacio and gave me the opportunity to meet her. Of course, I took the chance to ask her to share some of her dancing experience with us. Amazing as a dancer, this wonderful woman radiates a mysterious and inspiring positive feeling about what a dancer’s life is, all through her wide vision and intuition of creativity through dance. I asked her a few questions about her current work and dancing biography. Her answers were all so full of teachings and interesting matters that I decided to transcribe almost everything she told me. Therefore, you’ll see that the text of this interview is a bit longer than usual. I just didn’t want you to miss any of this great conversation…! CONTEMPORARY-DANCE.ORG: So, Nejla, what are you currently working on? NEJLA JATKIN: Currently I’m interested in expanding dance into various aspects of life. Before I was only interested in dance being in the theater but now I feel like dance needs to bee everywhere, so I do very different projects and I experiment. I have one project called “Dancing with the Cities”. I go into different cities and work with the local artists to do a project connecting the theme to the city: researching the city and the environment and how the environment affects people and how people move because of the environment… and so we work with local artists and create site specific pieces in different places. For example, I did “Dancing with Washington D.C.”, “Dancing with New York”, “Dancing with Berlin” and just last month I was in Honduras and I did “Bailando con Tegucigalpa”. Next city, next year, will be San Juan. CDO: Are you the director of the project? NJ: I am directing and putting everything together. For example in Honduras, I worked with 30 artists: pantomimes, musicians, videographers, sculptors and dancers. With the dancers it was more intense because I had to put them into choreography. We searched the city and I chose five locations and in each location I created a piece of art connected to it. I combined sculpture from a local artist, dance, music, poetry and videography; then in the next location I did only like sculpture with one cellist, music and a task for the audience; and in another one just a soloist and then have the audience move through the city and experience the different pieces; and they were guided by mimes so it was like a whole experience. CDO: And how long does the experience last? CDO: And what are your other projects? NJ: I also do dance on camera and produce my own projects for different performances. For example two years ago, for the anniversary of the fall of the Berlin Wall, I created a concert dance piece that I called “The Berlin Wall Project”. That one will come back because this year marks the 50th anniversary since the Wall was built, so I’m going to present it again, as a kind of a remembering act. The piece is inspired by stories. I interviewed people who lived with the Berlin Wall. I also grew up with the Berlin Wall, so I’m very connected to life with it, so the piece is about stories and memories of the Wall and the reality of growing up with it. I’ll be presenting it in New York at the International New York Fringe Festival in August and then we go to Chicago. NJ: I did three parts of this project: a dance on camera piece that is called “The Wall”, and is right now showing in different dance on camera festivals; a concert dance piece called “Wall stories”; and then I did a site specific piece called “Dancing with the Berlin Wall”, which was on the day of the anniversary. I presented the idea of the Berlin Wall in different media: film, site specific and concert dance. Doing the piece in different media had to do with the thinking that the film would be there forever and you could go back and see it (it’s a ten minute, very abstract, just dancing with the Wall, based on the memory of seeing a woman trying to look over to the other side from the west to the east). And then “Wall Stories” is a concert piece that is presented several times, based on stories of people and reflections on living with the Wall, and then the “Dancing with the Berlin Wall” is a just one time site specific experience. CDO: Do you do other things than this kind of projects? NJ: I also do solo works in between because I like doing long pieces. I tour my solo works in different ways, I create for my company, projects or site specific pieces, and I give workshops like master classes in between. CDO: What are you transmitting in your workshops, your technique? NJ: Yes, I call it mosaic and I call it like that because it’s like a mosaic painting, where you take little pieces of different techniques you learnt and then you put them into your own mosaic painting, like your own structure. I give those training classes but I also teach choreography, mostly for Universities, because the structure of the programs allows it. Those students are already taking technique classes so it’s nice to do that. In open workshops, I usually do something from my own repertoire as well as my technique class and improvisation. But it depends on the students, it changes. I do it at the moment and looking at the dancers and what they need. As a teacher you have to be very open to who you have in front of you and who you’re teaching. CDO: Are you the manager of all this? NJ: Yes. I believe it’s a lot about connections. Most of the things that happen in art are due to connections, networking or knowing people. It’s too hard to just send your stuff and get something; even managers can´t do it. If you’re like Baryshnikov or have a big name, your manager can get stuff for you, but if you don´t have that big name then your manager can´t do anything… and they don´t usually do anything for you. So I’m doing my own networking. CDO: Do you think it is important to live in New York, especially for that kind of matters like contacts and possibilities? NJ: No. I’ve lived just two years in New York. I lived in Washington D.C before and all my contacts came from there. It’s from being active, proactive, doing a lot of things, going to concerts networking, going to conferences, talking, presenting, showing work, even if you don’t get anything…. you have to keep showing, keep doing things, keep experimenting and working in different ways, because nobody is going to do it for you. In art it is very difficult. I do all these things because I love it. My focus is in dance and everything I do is connected to dance: teaching dance, choreographing dance, presenting dance, talking about dance, doing a blog about dance, going to festivals, going to conferences to listen or talk about dance… so it’s all like networking in different ways and then different ways come back to you. You’re always busy in a way and you always learn from different things. CDO: Do you achieve to live financially from dance? NJ: Yes, I’m living only from making art. I’m not doing anything else. Now I have a position which is of artist in residence at the University of Notre Dame. I perform and represent the University abroad; it is a creative job and the working schedule is flexible; as an active artist, it is difficult to be there everyday rigidly and they understand that. CDO: How was your path to get to where you are now? NJ: I was born in Berlin from Turkish parents. Growing up with a Turkish background in Germany was very hard because those are very different cultures. Women’s place in the Turkish culture is very constraint and conservative and Germany is very radical and undergrounded. I grew up in the middle of this struggle and being very disconnected from my home culture, surrounded by the German culture. Dancing was then a concern at home. I was not allowed to dance so I did it in secret. I had a secret life out there and at home I was a good girl, doing everything to please my parents, cleaning the house, being quiet, doing my homework… but out there I had a different life. It was easy for me to do this because my parents were very disconnected to my school life as they didn’t speak the language. They didn’t know what was going on at school so I had my own schedule and could tell them: I’m doing homework or school is longer…. So in the afternoons I was dancing with a group that was directed by two Americans from New York. They had a youth company called “Space and Time”, which was sponsored by the German government. It was an after school program at a youth center. CDO: What type of dance were they teaching? NJ: They were teaching contemporary-modern, but it was more like the old modern tradition. We had everyday training for three hours. Some days we would have floor bar, other days we would have like jazz-modern and then other days straight modern, so it was a very interesting combination. And then we would perform too and the pieces that they would do were like really professional pieces from their repertoire, so they were emotionally hard to do. It was a great experience. This lasted through high school for around five years and then in the later years before I graduated, I was assisting the director with choreography and teaching and he was pushing me to teach. But I was never thinking about this being a profession. But then on the last big celebration of high school, I organized a performance with the students. I taught them a dance to Pink Floyd and I did a little solo on this… “We don’t need no education” (loud laughing)!!! CDO: And your parents, did they come? NJ: They didn´t come because by that time I had left home. Before I finished high school I had left home with a big break because I couldn’t handle with my mother’s oppression. I had a big crush with my mother and I left from one minute to another. I just took my stuff, left and stayed with a friend. -Oh my god!… you have to dance, you have to dance, this is your calling, this is what you have to do…! And I was like in shock and asked her what she meant. And she said: - Just go to the conservatory and apply for the dance conservatory in Berlin. And I was like, what do you mean? I’m not prepared, I don’t know how to audition, what am I supposed to do? -No, you have to go, just go, do it. CDO: So you entered a conservatory? While doing that, to make money I would do small performances, modeling, little video clips, tasks in musicals, improvisations with jazz musicians or teaching in the evenings. That’s how I went through school. After finishing in the ETAGE, I worked in Germany with independent choreographers. I danced with the butoh artist Anzu Furukawa, who was famous in the 80s in Europe. She had a company called “Dance Butter Tokyo” and did projects bringing artists from different countries. She had multicultural groups and combined butoh and modern dance; she also combined your style with hers, so it was an interesting experience. I also worked with the “Pyro Space Ballet”, which was a contemporary ballet that did evening length productions to techno music from this famous techno musician named Cosmic Baby. I toured with them all over Germany. I also worked with another artist in a crazy space in a bus repair arena that they changed into a performing space. There we did a very intense dance-theater piece. So I tried a lot of different styles. After that period, the Wall had come down and Berlin was really ugly. I was exhausted of all this projects and touring and travelling and I was also doing solo works. I got invited to perform in Canada and while performing there, a presenter who saw my performance invited me to come to the U.S., to perform my solo works and give some workshops in three cities. So, I did a little tour in Chicago, Phoenix and Arizona. At that time I was thinking about finding a company that would be doing African-American dance in the line of Alvin Ailey. I was interested in the combination of the two cultures and I wanted to learn how it was being done because as I come from two different cultures, the Turkish and the German, I was trying to figure out how this fusion could work and learning from other examples. So I looked into different companies and I found five major companies in the U.S. that did African-American works, beside the Alvin Ailey. There’s “Philadenco” in Philadelphia, “Dallas Black Dance Theater” in Dallas, the “Cleo Parker Robinson Dance Company” in Denver, the Lula Washington in Los Angeles and the “Dayton Contemporary Dance Company” in Dayton. Those are the five main companies that do African-American repertory. So when I was in Chicago, somebody knew Cleo Parker Robinson Dance and they suggested that I should go and work with her because I would fit into her company. I called her up, she invited me to go and I stayed with her for a week and kind of auditioned. But I had to go back to Germany because I had to finish a tour with the “Pyro Space Ballet” and also she didn’t have a spot at the moment. But still she said that if something opened up she would call me. I didn’t think nothing would happen, so I went back to Germany and when I was just finishing my tour I got a call from her, saying that one of her dancers had gotten injured and that she needed a replacement immediately. In two weeks I was in Denver, where I worked for four years. It was intense and a great experience. We did a lot of repertory of famous African-American choreographers, contemporary and new choreographer’s works and a big opera production yearly. We had to dance all day long, but were paid so didn’t have to worry about anything other than just dancing from 9 am to 5 pm, and then touring all over the U.S.. It was a great experience. I learnt a lot. CDO: Were you tired at a moment? NJ: Yes, it was very intense so at a moment I was ready to experiment and choreographing. And at that time I had also gotten married. So it was a moment for a change. After I finished with that company I moved to Dayton and worked with one other company full time. But the director died that year and it was a hard transition. I didn’t want to be there after that. By that time I knew I wanted to do my own projects and I had ideas and was ready. We moved to Washington D.C. and I got a position as associate director of contemporary dance in the American Dance Institute of Washington. But I was only there for one year. During that time I was also doing my solo projects. In one festival I presented a piece and the director of a University saw the piece and invited me to have a position there. So I started working for the University and did my own projects: solo works and in between group works. But group works, as an independent choreographer, is very hard because there’s not a lot of funding for young choreographers and if you don’t have rich friends that can donate money it’s really hard… you have to pay for space, for lightning, for costumes, dancers, dancer’s rehearsals and nothing comes back in, because in dance you have 15 dollars tickets and 300 seats… you might just afford to pay the technicians. So I had to do a lot of solos in between. CDO: Are your solos like long pieces? CDO: So this was your last period, in Washington. What happened then? NJ: Now I live in New York and I’m doing my projects from New York as well as from Chicago, because my husband has a job there. But I work mostly in New York, because all my connections are on the east coast. And Chicago is a new city so I’m getting to know it. Chicago is a great Theater town, but they don’t have so much dance. So I’m also thinking of experimenting with theater a bit more in the future. CDO: And how do you see your dancing future? NJ: I want to expand my projects and continue creating, experimenting and finding limits or ways to express my self through dance. I wish to keep doing festivals and travelling around with my group. I also want to get to a point where I don’t have to worry about money, where everything just flows… that’s my dream. CDO: Thank you so much, Nejla. Is there some thing else you would like to share with us about dance? For more information about Nejla Yatkin and her dance work, visit her website at: Nejla Yatkin/NY2Dance.